What do you know about Australia’s richest and most influential business man in London? Frank Lowy is one of the Zionist Capitalists you may have heard less about. He tends not to be raised in the press and media in order to pursue his own commercial and political affairs comfortably. His network is a very big Donald Trump supporter and therefore can be said to be a big influence on his policies. 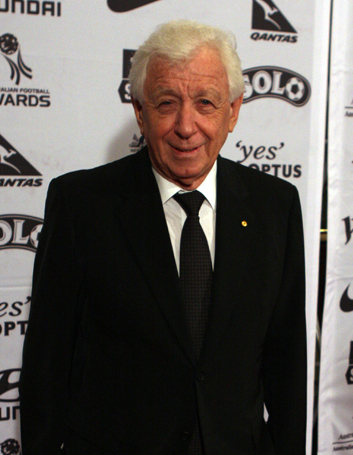 Frank Lowy is the wealthiest person in Australia; his business provides income in dozens of cities and several of the world’s countries; He is among the founders and mangers of influential Israeli and American think tanks; He has paid enormous amounts of money to influence large governments foreign policies towards the Middle East, especially in the Israeli-Arab conflict; finally he is one of the Zionists who received heavy compensation from insurance companies after the 9/11 attacks. Lowy was born on October 22, 1930, in Czechoslovakia, and lived in Budapest, Hungary during the World War II. After the end of the war, he went to France in 1946 so as to make his way to British Mandate of Palestine, but he was caught en route by the British and deported to a detention camp in Cyprus. However, after several months, Lowy was allowed into Palestine. Lowy fought in Israel’s war of independence as a member of the terrorist organisation Haganah. Then he joined the Israeli regime’s Golani Brigade, which was formed in February 1984. Lowy, who is also one of the Holocaust advocates, introduces himself as one of the survivors of the Nazi death camps. In 1991, he provided the cost of rebuilding the wagon that transferred Hungarian Jews to Auschwitz and put the vehicle on the ground of the concentration camp. In 1952, Lowy left Israel and joined his family, who had left Europe for Australia. One year later in 1953, he met a Hungarian called John Saunders. They jointly created the Westfield Development Corporation through the development of a shopping centre at Blacktown in Sydney’s western suburbs. Over the next 30 years, these the two developed a number of shopping centres across Australia and the US (from 1977). They changed the name of the company to the Westfield Group and listed the firm on the Australian Stock Exchange in 1960. Saunders sold his interests in 1987 and at the same time Lowy developed the company to New Zealand (in the 1990s) and the UK (in the 2000s). Lowy has appeared on the Business Review Weekly (BRW) Rich 200 list every year since it was first published in 1983. In 2010, the magazine measured Lowy’s wealth at $5 billion and introduced him as Australia’s richest person at that time. He also took part in investment and banking in London, New York and Los Angeles. After turning 80 in October 2010, Lowy officially stood down as Executive Chairman of the Westfield Group and took on the role of the General President. Since then, his two Sons, Steven and Peter, became joint Chief Executives of the company. Peter Lowy, who is a member of the board of directors of the Simon Wiesenthal Center, was formerly Chairman of the board of trustees at the University of Judaism, which is now known as the American Jewish University. Lowy’s enthusiasm for banking was not limited only to the US. He is one of the members of the board of directors of the Reserve Bank of Australia, which is the same Australia’s Central Bank. Lowy also served for 10 years as President of the Reserve Bank of Australia. In 2003, Lowy was appointed as Chairman of the Football Federation Australia (FFA). Four years later in 2007, Australia nominated for hosting the 2022 FIFA World CUP, but eventually Qatar was awarded the right to host the sports event. In September 2008, it was announced that Lowy was elected as a member of the FIFA board. Frank Lowy and his co-partner Larry Silverstein, himself very close to Benjamin Netanyahu, had rented the whole World Trade Centre (WTC) for 99 years just a few weeks before the 9/11 attacks. The deal was done by Lewis Eisenberg, former Chairman of the Port Authority of New York and New Jersey. Prior to the 9/11 attacks, Eisenberg was elected as Chairman of the Republican Leadership Council. Furthermore, in 1980s, Eisenberg resigned from the controversial Goldman Sachs Bank, after his secretary accused him of sexual abuse. In 1987, Silverstein constructed the World Trade Centre 7 on the ground, which he had rented from the Port’s board of trustees, but the building number 6 of the WTC complex remained under the government’s control until when Silverstein and Lowy signed a ninety-nine-year lease with the board of trustees on July 26, 2001. According to the new contract, Silverstein took the control of 6.10 million square feet of the WTC’s office space. Moreover, Lowy became responsible for 427,000 million square feet of the complex’s entertainment and sales space in the basement floor. The WTC complex buildings 1, 2, and 7 along with Westfield Hotel were ruined in the 9/11 attacks, so Silverstein and the Westfield company pocketed about $5.4 billion from the attacks. On April 14, 2002, the Sunday Times revealed that Lowy had bribed one of the Tony Blair government’s officials. The newspaper reported that an Australian property group headed by one of the world’s richest men had paid a £250,000 bribe to Lord Levy, one of Blair’s closest and most trusted aides. These payments, which the company tried to make them secretly, were started from 1999, when Lord Levy began his work as Tony Blair’s special envoy to the Middle East. These amounts were paid under the order of Frank Lowy, Chairman of the Westfield company. From 1999 Lowy was employed as an advisor without having any specialisation in the activity by the Westfield company, and received £3,800 weekly. During his three-year mission, Lowry travelled 45 times to 19 countries and visited Israeli and Arab leaders. After Lowy came under pressure to disclose his relations with the Westfield, he broke off his cooperation with the company. Lord Levy is also a committed Zionist and a member of the Labour Friends of Israel (LFI), which is a parliamentary group affiliated to the British Labour Party. 11 September 2003 : New York, the WTC complex buildings 1, 2, and 7 along with Westfield Hotel were ruined in the 9/11 attacks, and consequently about $5.4 billion went into the pockets of Lowy and Silverstein. 21 September 2005 : Westfield Mall in Perth, Australia, bomb threat. 17 May 2006 : Westfield in Woden, Australia, bomb threat. 21 July 2007 : Court house adjacent Westfield Centre Derby, England, bomb threat, which caused evacuation of Westfield premises. 01 March 2008 : Westfield Old Orchard Mall, Skokie, Illinois, bomb threat. 20 April 2009 : Westfield Hotel Annapolis, bomb threat. 20 September 2008 : Marriott Hotel in Islamabad, Pakistan, bombing. 17 July 2008 : Marriott Hotel in Jakarta, Indonesia, bombing. In September 2011, Frank Lowy opened Westfield Stratford City Mall, which is situated near the Olympic Park. With regard to Lowy’s talent for investment in places that are victims of terrorist attacks, the question raises that whether the Olympic Park would be a possible target for terrorist attacks. The insurance companies have been committed to compensate about $7 billion for lost profits, if terrorist attacks happen. Apparently, some people and companies would earn huge profits from tragedies and sufferings of the masses. The insurance company Pool Re, which is led under the supervision of the British government, has provided a $7 billion insurance cover for terror threats occurring during the 2012 London Olympic Games. Steve Atkins, Pool Re Chief Executive, announced that his team has carried out close scrutiny to find out how much customers are in danger of terrorism so as to prepare itself against possible terrorist attacks. The Pool Re company has an extraordinary talent for insuring places, which later become targets of terrorist attacks. The biggest loss incurred by the Pool Re, was the Bishopgate bombing in London 1993, in which it was forced to pay £260 million in compensation. Moreover, the insurance company paid another £240 million in the 1996 Manchester bombing. It also lost tens of millions of pounds in the July 7th 2005 terrorist attacks. Frank Lowy is not active only in economics; he is also very interested in politics. He was appointed as Deputy Chairman of the Israel Democracy Institute in 2001 and two later in 2003, he established the Lowy Institute for International Policy. The Institute was a think tank in the field of foreign policy, which worked on foreign affairs. Lowy’s activities caused him to be awarded the Woodrow Wilson Awards for Corporate Citizenship in 2005. In the same year, the Institute transferred its central office to Sydney. The new office was opened by John Howard, the Australian Prime Minister and Lowy’s close friend. Lowy also founded the Israeli Institute for Policy and National Strategy, which will operate in the framework of Tel Aviv University. In addition, Lowy is a member of the Brookings Institution International Advisory Council in Washington, which is considered as the most influential American think tank. The establishment of those think tanks caused Lowy to be awarded the Woodrow Wilson Awards for Corporate Citizenship in 2005. However, Lowy’s interest in intervening in world affairs is not limited only to the above-mentioned ones. He is also Deputy Chairman of a right-wing monthly magazine called the Australia/Israel Review (AIR), which is a subset of the Australia Israeli Jewish Affairs Council (AIJAC), Australian version of the American Israel Public Affairs Committee (AIPAC).